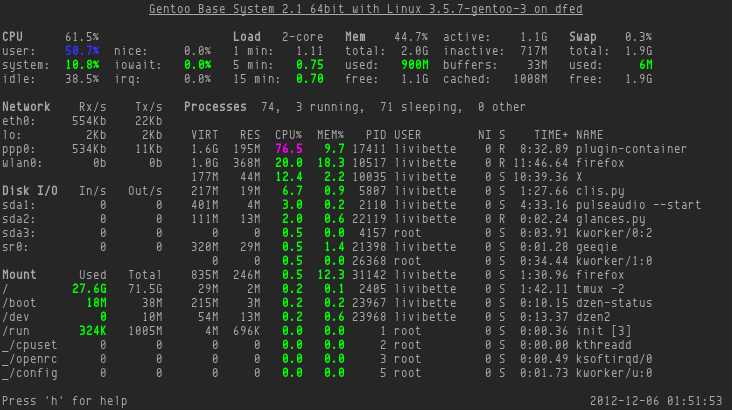 I came across Glances, a system monitoring program written in Python, as its name hints, it enables you to review system information, status, or resource usage in just a few glances. As you can see from the screen shot above, all information in one screen. CPU: Glances probably the only few programs which display the details of what CPU spends time on rather than just a simple percentage of utilization. How much time it's idling or waiting for IO? For example, iowait is an useful information, when disk is busy, more or less it could slow down the system for different reasons and by reading iowait, you know some heavy IO activity is going on. Load average: It's same as uptime gives, the load average of past 1, 5, and 15 minutes. Memory and Swap: Like CPU, more detail is shown, such as buffered, cached, active, or inactive memory. Similar to free command output. Network: Each interface's bandwidth usage, upload and download rates. You can press B to switch unit between bit/second and byte/second. Disk I/O: Read/Write rates on partitions and devices. Not only physical storage devices but also optical devices. Mount points: Similar information you get from df command, such as total size, used space, and available size. Processes: Like htop or top, you can use keys to choose sorting fields. Glances shows information as much as they can be fitted in terminal window size. You can turn off sections by keys, separately, if you don't need them. It also support server mode, a client can use XML-RPC call to get the system information in JSON format. It's possible to write your own client if you don't like default text-based client or you can write a GUI or web interface to display the data. It supports Linux, Mac OS, and Windows, although no default client for Windows, it will only runs as server due to no curses module available on Windows platform. Glances is only one-year-old, first released on December 4, 2011, there are many possibilities for improvements. For example, configuration file for colors or disabling sections by default. Also custom fields for processes, and the list can go on and on. I was intrigued by its name when I first heard of it and the idea behind this program is useful and simple. You don't need to run several programs to get all information of a system. You can have everything on one screen, even status of multiple systems at same time with client/server mode and terminal multiplexer. that of sequential programming is not as large as is commonly believed. computer-system simplicity, the optimal choice is NR_CPUS=0. has the beneficial side effect of rendering all kernel bugs harmless. when there are zero CPUs. Who would have thought the solution is just that simple, zero CPUs. All problems will be gone as long as you have zero CPUs. No more unexpected bugs and developers wouldn't be stuck in complex of design. Zero is the one. as well. Antimatter was proven to exist after all. Hint : nr_cpu_ids is an "int", not an "unsigned int"
Bonus: Existing bugs become "must have" features. Of course there is no hurry and this can wait 365 days. Using opposite to negate the disadvantages of having CPUs. As if matter-antimatter collides, which results the energy generated much more than by options we have today. We may have several orders of magnitude greater than currently most powerful CPU's processing capability. Lucky for Linux user, this technology doesn't need to wait for long. Less than 365 days to go. Since then, our Linux box will be able to do almost everything in a split of a second, which needs an hour or so at the moment. No doubt that the major OS developers will try to patent it. Someone with good heart has to prevent such thing from happening and allows everyone to use this new concept freely. This is the future of human beings, not just computing, we can not afford being ruined by corporations.